Mihran Mesrobian's name has had a great significance for the architectural researchers of Washington. 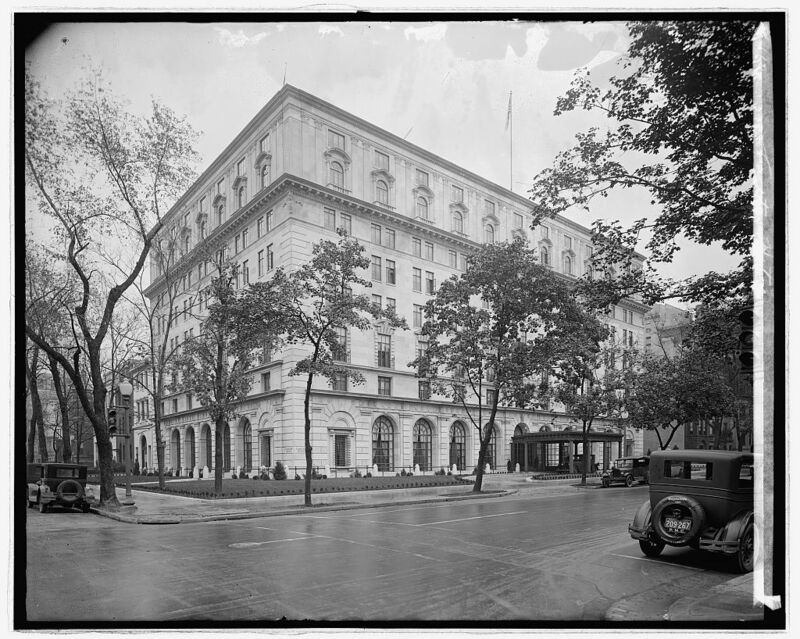 He was one of the leading architects of Harry Wardman, a famous real estate developer of Washington in 1920s. 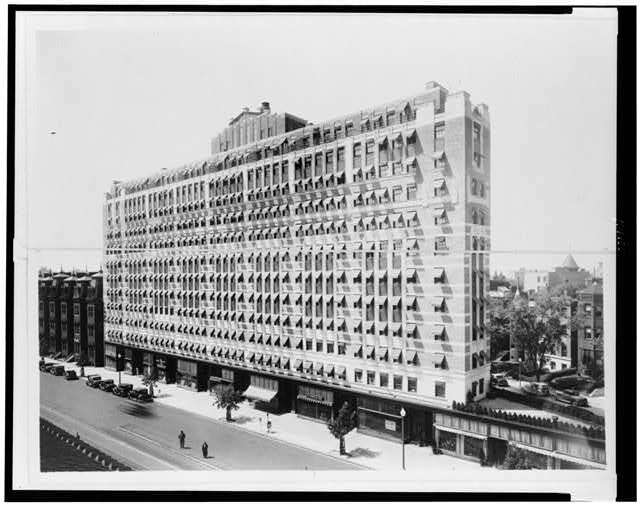 Mihran Mesrobian designed a number of remarkable buildings in the city, such as the Hotel Carlton Hotel Hay-Adams, Wardman Tower and many others. These constructions are the city's trademark to this day. However, the story of MesrobianвЂ™s life is even more spectacular. Mesrobian was born in merchants' family, in the city of Afyon in the Ottoman Empire. He had been a man of art. At age 15, he was enrolled in the second year of the prestigious Imperial Academy of Fine Arts (Academie des Beaux-Arts) in Istanbul, which now called after the name of one of the most famous of Ottoman architects, Armenian by origin - Sinan. At the age of 20 he was appointed as the municipal architect of Smyrna. He also participated in the restoration work on DolmabahГ§e Palace In Istanbul, built by the Armenian Balian family architects. Unfortunately, World War I and Armenian Genocide made changes in his fate. 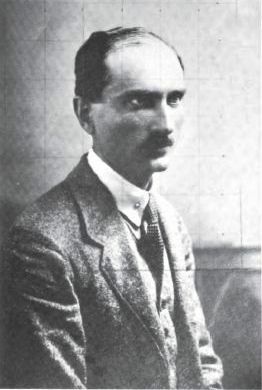 In August 1914, only a few months after his marriage to Zabel Martmanian in Smyrna, Mihran Mesrobian was conscripted into the Turkish army. Coming officer training, in October 1914, he began serving in the rank of second lieutenant. As a military engineer, he took part in the Battle of Gallipoli, in the Russian front, and then was transferred to Palestine and Syria. 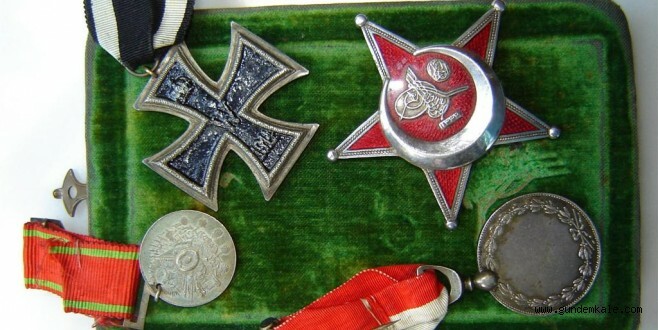 He was awarded two Turkish medals of honor and the German Iron Cross for his service at Gallipoli. Returning from the war, Mesrobian discovered that his brother's families and his underage sister were deported from Afyon in 1915, and his property confiscated. He had never heard of them after. In August 1921, Mihran Mesrobian with his wife and two sons immigrated to the USA, where they lived a long and fruitful life. 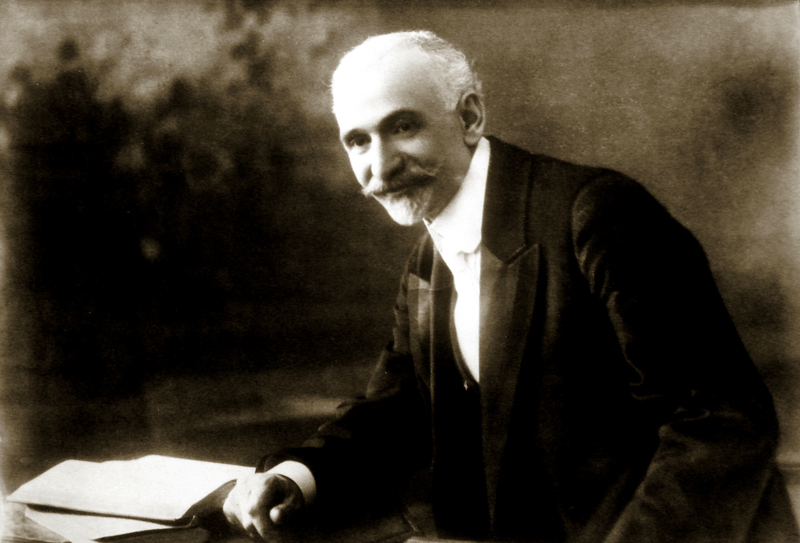 Story of Mihran Mesrobian is reminding a biography of Sarkis Torossian and other Armenians, who were drafted into the Ottoman Army during the WWI and whose families, at the same time, became victims of the Armenian Genocide. Mihran Mesrobian's granddaughter Caroline Mesrobian-Hickman, a best known researcher of her grandfather's art, shared her memories about him. Dear Caroline, could you please tell about MesrobianвЂ™s family, who were his parents? 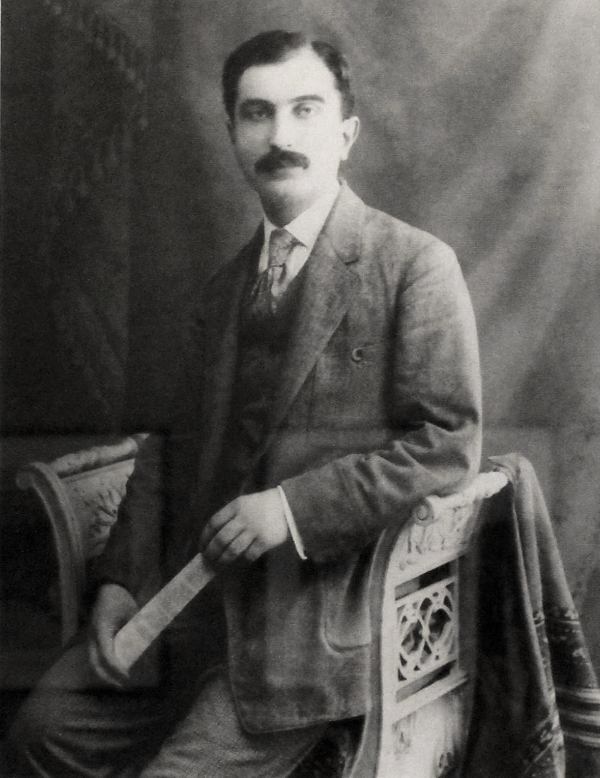 Mihran MesrobianвЂ™s parents, Gaspar and Miriam (neГ© Palanjian), lived in Afyon Karahisar, a town in western Anatolia whose population was predominately Turkish. Armenian and Turkish sources agree that around 6,500 Armenians were living in Afyon in 1914, with very few Greeks and Jews, and about 89,000 Turks. Afyon had been connected by railroad to the major Ottoman cities of Istanbul and Izmir/Smyrna since at least the 1860s. It was well known for its very high-quality opium and cereal production, also for inlay furniture. Generations of the Mesrobian/Messrobian family had lived in Afyon. MihranвЂ™s father, grandfather, and other branches of the family were cereal and opium merchants. Mihran had three brothers and one sister. Their parents died before WWI, and we presume they were buried in the Armenian cemetery in Afyon. Is it true, that Mesrobian was placed in the second year class of the Academie des Beaux-Arts in Istanbul at the age of 15 as being quite advanced in drawing? According to an oral history that Mihran gave late in life to his son Ralfe (my father), he showed talent for drawing at an early age. He graduated from the Sahakian School, the largest Armenian school in Afyon. 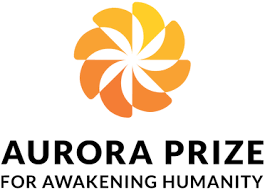 The curriculum was modeled on European standards. The classes that were of particular benefit to Mihran were math, drawing, penmanship, and manual labor/construction. So Mihran had the opportunity to develop his talent at an early age. The school also taught Armenian, Turkish, French, and English. MesrobianвЂ™s fluency in French was very useful when he entered the Imperial Academy of Fine Arts in Istanbul, because a number of the teachers were either French or were Turks who had studied in Paris. He could also read and write Ottoman Turkish. So the Sahakian School prepared him well to enter the Academy. According to the oral history, Mihran placed out of the first-year classes at the Imperial Academy in Istanbul, which were largely devoted to drawing and copying models. In 1909 Mesrobian was appointed as a municipal architect of Smyrna. Can we find any information and any drafts or photographs about his works during that period? Mihran was in full charge of building inspection while he was municipal architect in Smyrna, 1909-1912. He left a summary list of the buildings he designed in Smyrna: one hotel, eight houses, one warehouse, one market containing sixty-four stores, one bank and club house, of stone and concrete construction. He also designed a topographical map of 1100 acres, dividing it into 1615 lots; and opened irrigation canals and planning sites of farmhouses. As is well known, a large part of Izmir/Smyrna burned in 1922, along with the municipal records. The only visual evidence of his output in Smyrna is the hotel mentioned above -- a small hostelry built in 1912. 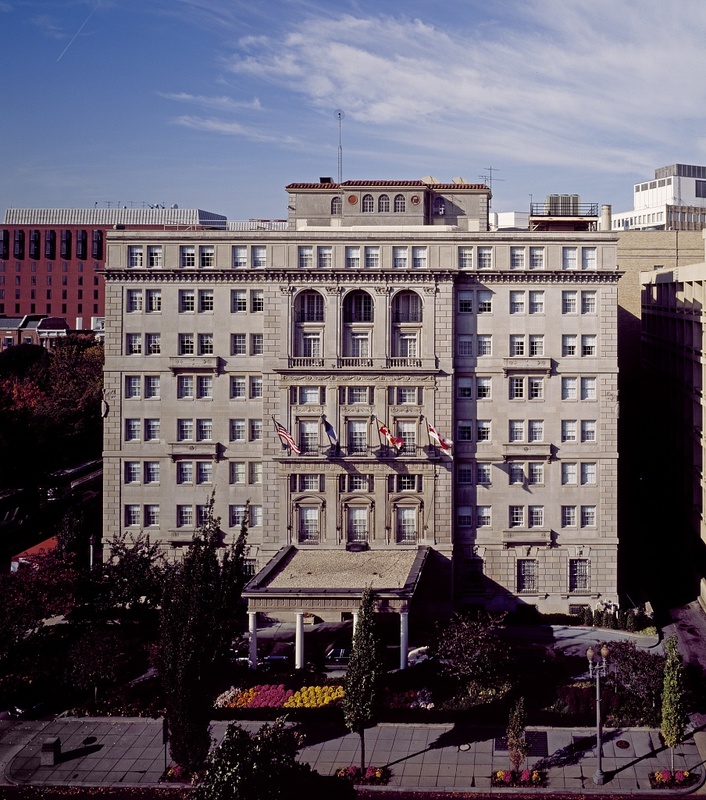 The photograph that Mihran brought with him to the U.S. was taken just before the building opened, so we donвЂ™t know the name of the hotel or its address. I was in Izmir last October (2013) and walked through a number of streets in the former old city, but didnвЂ™t find the building. There are pockets of buildings still extant that date from the late 19th and early 20th century, so it is possible that one or more of his buildings still stands. What is known about Mihran Mesrobian's participation in World War I? In which battles he had taken part in? Mihran was drafted into the Turkish Army in August 1914, just a few months after he married Zabel Martmanian in Smyrna. 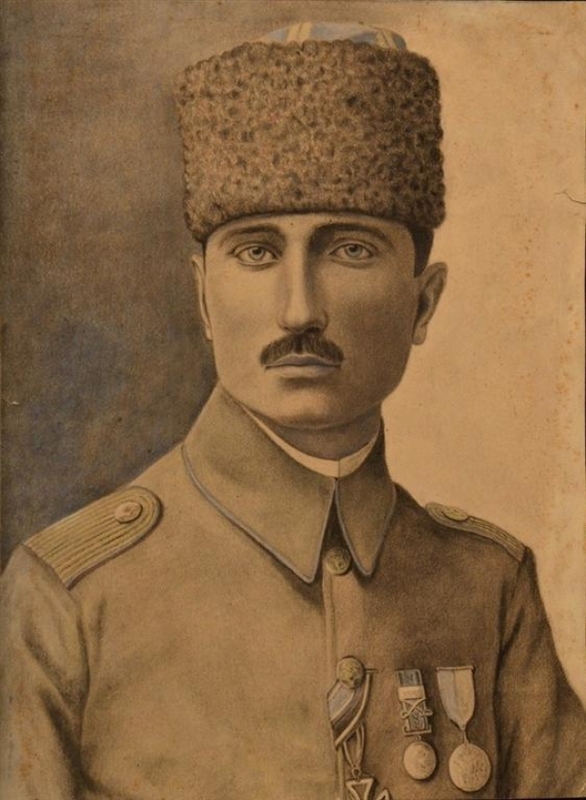 He graduated as a 2nd lieutenant from the Beylerbeyi Reserve Officers School in October 1914 and was assigned to the 4th Fortifications Regiment, as an engineer. He evidently served also at some point in the 1st and 3rd divisions. He was sent first to the Dardanelles and participated in the Gallipoli/Gelibolu campaigns in late 1914 to 1915. He then was at the Russian front, enduring a harsh winter when the snow was many, many feet deep. He of course had to travel through parts of historical Armenia to the Russian front. His battalion was then sent to Palestine/Syria. How long did he stay in captivity in Egypt? In the fall of 1918, a major offensive by the British and their Arab allies resulted in much of the Turkish 4th Army Corps being taken prisoner by Arab irregulars. MihranвЂ™s unit became separated from the main unit. They wandered for days and were then captured by Arabs. 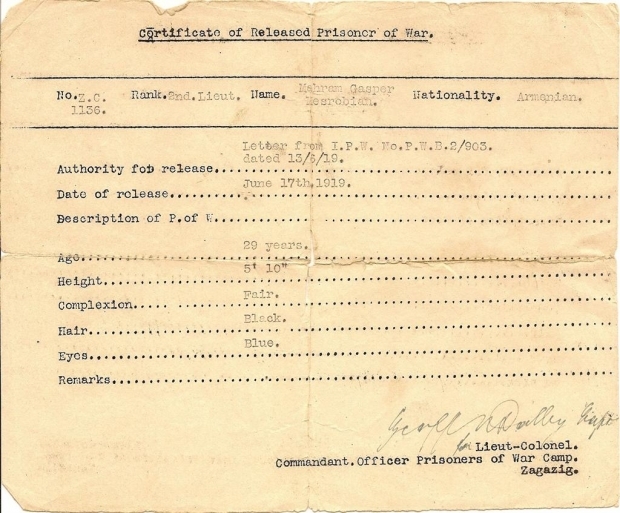 He was in an officersвЂ™ prison for about 6 months, from late fall 1918 to May 1919. According to the oral history Mihran gave to his son Ralfe, the Arabs who captured his unit were going to kill all of them. But T.E. Lawrence, who happened to be in the area, interceded, reminding the Arabs that prisoners of war must not be executed. Mihran spoke about this incident a number of times, always crediting T.E. Lawrence with saving his life. Although I have not found documentation of this, we have no reason to doubt his account. Which military awards and rank did Mihran Mesrobian obtain during the WWI? He was a lieutenant in the reserve army corps. He was awarded two Turkish medals of honor and the German Iron Cross, for his service at Gallipoli. His work included building and repairing roads, mines and tunneling, siting and designing fortifications, and drawing topographical maps. 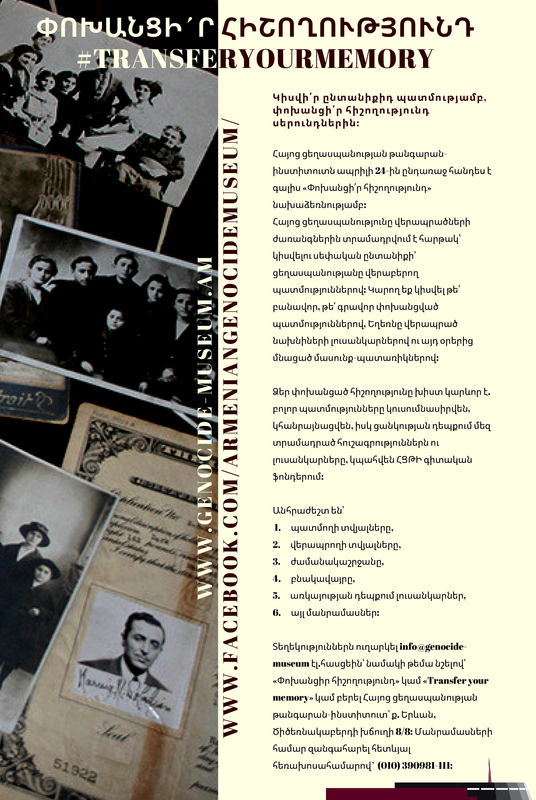 How has the Armenian Genocide affected on Mesrobian family? Mihran's three brothers were all married and had families, but his teenage sister Palazoo was not. They were all deported from Afyon in August 1915 and never heard from again. Mesrobian/Messrobian cousins were also deported. After WWI, Mihran returned to Afyon to try to regain and sell his family property but was unsuccessful. Census information shows he was not from the Armenian Quarter but from the Haji Murad Quarter, which was a more recently established multi-ethnic neighborhood outside of the old city of Afyon. How do you remember your grandfather, what kind of person he was? To a small girl growing up in North Carolina who visited my grandparents only twice a year with my family, Mihran was to be treated with great respect. He seemed foreign to me, very reserved. He did not talk very much, at least when we were visiting. But I could tell that he was very perceptive and intelligent, watching my sister and me like a hawk! His paintings and watercolors filled the house and were amazing to ponder. He was often not well вЂ“ understandable when we consider all that he had endured in his early life. I also remember he and my grandmother working in the kitchen to prepare wonderful Armenian recipes. I wish I had the perspective I have today and could have a series of conversations with him about his experiences and his architecture. How many times have I wished for that!! But I feel that I know him very well through his buildings. I have studied them for years and have immense pride in his remarkable works and what he was able to accomplish as an immigrant. He was a true survivor. He had remarkable talent and had the great opportunity to use it fully in the US. What about his influence on your career in architecture history? Architecture is in my blood; my father was also an architect. But I didnвЂ™t get any artistic talent like my sister, so I decided to study the history of art and architecture. How remarkable that I would end up living in Washington and be able to admire, study, and write about his buildings. ThatвЂ™s an enduring bond for which I will always be grateful.